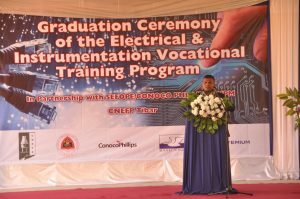 A group of 18 Timorese were the first to graduate today from a new vocational training program at Cento Nacional do Emprego e Formação Professional, CNEFP-Tibar. They will now go on to industry placements and employment with a range of local & international organisations to gain industry exposure and put what they have learnt into practice, with some going directly into employment. The Level II Certificate in Electrical and Instrumentation Maintenance training was a pilot program developed by ConocoPhillips, representing the Bayu-Undan Joint Venture partners, the Autoridade Nacional do Petróleo e Minerais (ANPM) and Secretária de Estado Para Formação Profissional e Emprego (SEPFOPE) and is jointly implemented by CNEFP-Tibar and ACTEMIUM. 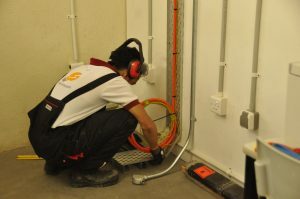 The 12-month course involved 3 months of theory and 9 months of practical in both disciplines. Recruitment will soon start for a second group of trainees, with training set to begin towards Q4 of 2018. Mr. Gualdino da Silva, the ANPM President, “On behalf of Timor-Leste Government, ANPM would like to extend our appreciation and recognition for the good cooperation with ConocoPhillips and its Joint Ventures through Cost Recoverable Local Content Project of Bayu-Undan in supporting the successful delivery of the skill vocational training program focusing on Level 1 & 2 Electrical and Instrumentation training with Global Training Standard. Mr. Gualdino da Silva, the ANPM President also highlighted, “to maintain the program sustainability, the program shall offer to the assigned CNEFP, Tibar trainers the Training of Trainers program to produce the skilled and competence trainers to run the program in the long term run”. “To enhance the technical skills and vocational, we expect to have continues collaboration to support and expand these opportunities across the energy sector. The excellent opportunities are very limited and competitive; hence, I would like to encourage the Timorese who have interest in gaining the technical skills and knowledge to be well prepared for the brilliant opportunities in the coming years,” said Mr. Gualdino da Silva, the ANPM President. H.E. Sr. Juliao da Silva’s stated” as member of government responsible for Professional training and employment, I greatly committed during my mandate to invest in the area of professional training because it is a necessity and important to all of us to prepare our young people to be ready to compete in labour market domestically, regionally and internationally. Therefore, today’s ceremony of handing the completion certificate trained under the CNEFP Tibar indeed will respond to the demands of the industry and there is a great need to give a continuity to the program and to the CNEFP Tibar to trained more people in the same areas”. This training program was fully funded through the cost recoverable Bayu-Undan local content project.